Regular exercise to restore your knee mobility and strength and a gradual return to everyday activities are important for your full recovery. Your orthopaedic surgeon and physical therapist may recommend that you exercise approximately 20 to 30 minutes two or three times a day and walk 30 minutes, two or three times a day during your early recovery. Your orthopaedic surgeon may suggest some of the following exercises. The following guide can help you better understand your exercise/activity program, supervised by your therapist and orthopaedic surgeon. While sitting at bedside or in a chair with your thigh supported, bend your knee as far as you can until your foot rests on the floor. With your foot lightly resting on the floor, slide your upper body forward in the chair to increase your knee bend. Hold for 5 to 10 seconds. Straighten your knee fully. Walk as rhythmically and smooth as you can. Don’t hurry. Adjust the length of your step and speed as necessary to walk with an even pattern. As your muscle strength and endurance improve, you may spend more time walking. You will gradually put more weight on your leg. You may use a cane in the hand opposite your surgery and eventually walk without an aid. When you can walk and stand for more than 10 minutes and your knee is strong enough so that you are not carrying any weight on your walker or crutches (often about two to three weeks after your surgery), you can begin using a single crutch or cane. Hold the aid in the hand opposite the side of your surgery. You should not limp or lean away from your operated knee. The ability to go up and down stairs requires strength and flexibility. At first, you will need a handrail for support and will be able to go only one step at a time. Always lead up the stairs with your good knee and down the stairs with your operated knee. Remember, “up with the good” and “down with the bad.” You may want to have someone help you until you have regained most of your strength and mobility. Standing erect with the aid of a walker or crutches, lift your thigh and bend your knee as much as you can. Hold for 5 to 10 seconds. Then straighten your knee, touching the floor with your heel first. Repeat several times until fatigued. Hold for 5 to 10 seconds; repeat several times until fatigued. As you become stronger (at about four to six weeks) slowly increase the tension on the exercycle. Exercycle for 10 to 15 minutes twice a day, gradually build up to 20 to 30 minutes, three or four times a week. 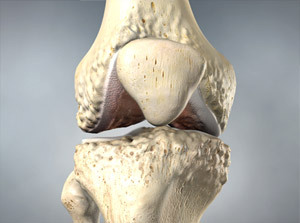 Pain or Swelling after Exercise You may experience knee pain or swelling after exercise or activity. You can relieve this by elevating your leg and applying ice wrapped in a towel. Exercise and activity should consistently improve your strength and mobility. 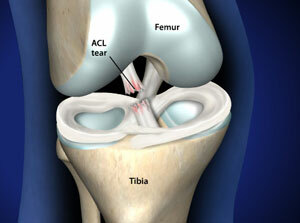 If you have any questions or problems, contact your orthopaedic surgeon or physical therapist.